Although I'm mostly writing about Slackware and Arch Linux related distributions I've got nothing against Ubuntu. I used it back with 5.10 'Breezy' and was quite impressed. It even detected and configured all multimedia keys on the cordless Logitech keyboard, including the volume wheel, no mean feat at the time. That was when Debian Sarge was too old to be useful and X burped on my hardware, and I did not know enough to run Testing or Unstable branches. Ubuntu has spawned some great distributions over the years, as varied and diverse as Vinux, Backtrack, Ubuntu Studio, the Ultimate Edition and Linux Mint, some only with a specialist group and purpose in mind, others aimed at a more general audience. Really, Ubuntu has become a bedrock to many distributions as much as it is built on the efforts of Debian itself. It probably is Daddy to more spin-offs and derivatives than any other distribution. The massive universe of packages available for Ubuntu and the frequent updates make it well-suited to choose as a base, without placing the need to maintain a lot of software on new projects. That branch of the linux tree always feels decidedly different though, just as the RPM using flavors do, from Slackware and its VectorLinux and Zenwalk derivatives in particular, which have a strong BSD-like feel to them. And so it comes all down to personal preference, whatever 'feels right' for you. For a serious user and enthusiast it is best to be as much as possible at home on all platforms, and it enhances employability. Flexibility is an important trait these days, as is dedication, and it never hurt anyone to expand your horizon, except people who are afraid to learn that their preconceptions were wrong. Enough with the waffle, let's get started. I have recently been lucky enough to acquire a second-hand Dell Latitude E4300 for an acceptable price, and I have to say it's a great little device, very capable and only two years old. Sure the 80GB hard drive these laptops typically came with is a bit limiting, but it's really only intended as a larger netbook for browsing on the go and for taking notes & word processing. The 13' screen is better for reading and it's still easy enough to carry. This machine urgently needs an OS and will be my test bed for Ubuntu Linux. Dell is using mostly Intel chip sets for wireless and graphics which are widely supported without the need for additional firmware or binary drivers, and has even sold machines with Ubuntu preinstalled, so it came as no surprise that the Latitude played extremely well with both editions. So please bear in mind that the set of hardware is not a challenging one, but probably as good as it gets for compatibility. That said, I've previously installed various Kubuntu and Ubuntu since 10.04 for short periods on the Acer and the built in proprietary driver installer always worked flawlessly on identifying my hardware and getting the right driver for it, namely ATI/AMD Fglrx and the Broadcom binary blobs for wireless. It's nicer though if it all works straight away and is already natively supported in the kernel. It feels cleaner and runs smoother, or maybe that is just my imagination. I first installed the latest update 10.04.4 of the previous LTS (long-term support) release nicknamed 'Lucid Lynx', now two years old, and let it take over the entire hard drive for a quick install so I can get on the net. This of course by default does not even create a separate home directory for the users files, but that is ok for now. This part certainly works very well in a case like mine where what you really want is a no muss no fuss install with minimal input so you can get going, but note that a swap partition was created but not added to fstab. I also chose auto-login for my little surf station, and was blown away by the speed on reboot. 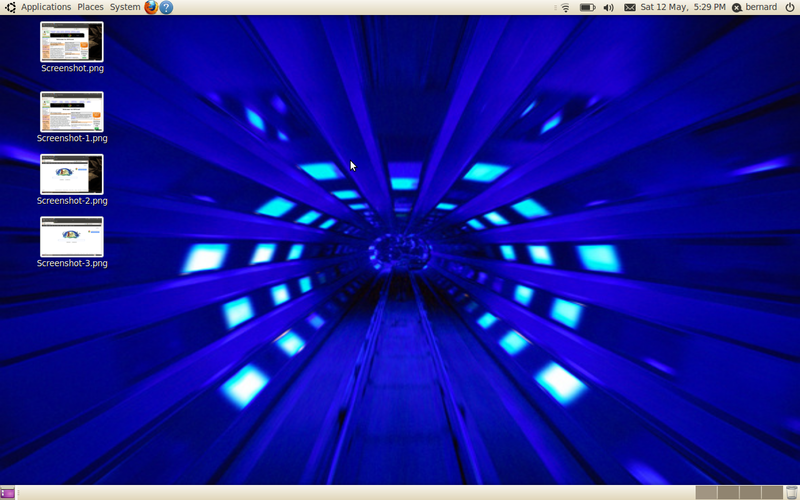 I was not presented with a boot loader and found myself in Ubuntu 10.04 in almost exactly 10 seconds. By the way, even after kernel update I was still not presented with a loader to choose from later on. However, in record time I was in a now old-fashioned GNOME 2 desktop, not even ArchBang is booting into Openbox this quick, a definite contender on hardware that is probably classed at the lower end these days with a 2.3 GHz Core2Duo and 2 GB Ram. Wow. Although older, this actually seems more powerful than my other laptop with an AMD X3 Phenom and twice the memory, using only the x64 editions by the way. Cache will have something to do with it, but it would be interesting to see a head to head comparison of these CPU's. 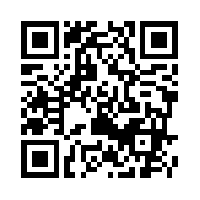 Have to search Phoronix, Tom's Hardware etc. The desktop was just amazingly fast, like using Puppy Linux on powerful hardware, even OpenOffice opened almost instantly. In terms of software you get the latest Firefox 12 after updating, the venerable OpenOffice 3.2, and plenty of other software of the standard desktop of the time like the Totem media player. And that's where we hit the first problem. Reviews are often nothing more than anecdotal evidence, you try what you try and write about it, had you tried something else the story could have been different. Alas, multimedia is a pretty common test for functionality. Despite installing Flash neither the Youtube nor the BBC iplayer in Totem worked, and it's noted that the option to play the BBC has disappeared from the new Totem in 12.04. It actually never worked for me in any distribution so I won't fault Ubuntu here. However, Youtube normally worked for me in GNOME but not this time, not in 10.04, complaining instead about a missing library. Surely this should have been installed as a dependency? I tried Minitube, a little player that's letting you watch Youtube like TV, but no luck here either. Just to confirm, watching the site's videos in Firefox worked fine. Not so good, but to make up for it the suspend and resume features worked without a hiccup and lightning fast, and overall I'm most concerned with the speed of booting and going to sleep and coming out of it, which is phenomenal. The wireless easily reconnects, too. Shutdown is equally fast and takes something like 2-3 seconds on this machine. As the system did not know about the swap partition I was unable to hibernate. I'm not going into the choice of software with the default Ubuntu install at this point as it is reasonably well known. Suffice to say, repositories are still up to date for the major applications, and for plenty of others there are external PPA's and backports that can be added to ensure 10.04 will remain fresh for quite some time. With OpenOffice.org 3.2 you get a classic office suite still adequate for most needs, Firefox is with 12.0 at its current version, and Chromium 18 can be found in the main repository. What really stands out to me is the waste of space between various application bars and the top panel in the below picture when compared to the Unity desktop later on. Thanks to the slick theming the default Gnome desktop comes with and the relatively current software available it still feels very modern. To be honest, I haven't really used Ubuntu between 5.10 and 10.04, and was surprised how slick looking and gorgeous the included themes are, but that's of course a matter of taste. Desktop effects provided by Compiz were enabled straight away on my Intel graphics and felt amazingly smooth, no stuttering, crashes or artifacts like I have encountered with some other distributions previously (mainly the Fedora derivatives), but to be fair that was on different hardware. All in all, once you get used to buttons on the left, not bad at all. You've got about a year left until this one stops receiving updates as it reaches EOL in April 2013, but maybe, just maybe Canonical will tack on a few years and follow Red Hat, who have just extended support for their Enterprise Linux to 10 years (plus another three years Extended Life Support), but then that is mainly for the server and Canonical already offer five years there. I have to say there's some refined attention to detail in evidence here that makes Ubuntu a better distribution than I thought, like a localized dictionary search engine in Firefox for Chambers UK which was obviously brought about by my choice of time zone and keyboard layout at install time, the metallic but still warmly resonating glow of the Radiance theme, the smooth and solid flow of the desktop transitions giving it a professional aura, and the well-stocked software center in addition to Synaptic with over 33,300 packages available, and that without adding additional repositories. I never cared much for it, but have to admit that for the less geeky among us who just want to use their computer this might be a friendlier, easier to search interface. Another nice touch is that the screenshooter applet uses the title of your application window to name the file. Then there's the slick integration of email and social networking clients in the indicator applet and the fact that mobile broadband is ready to go in Network manager. So let's take a look at the new kid on the block, 12.04 LTS 'Precise Pangolin', which I installed around three weeks later after it was released and allowed it to resize and take over half the hard drive space, a little less than 40GB. Again, if you just want a quick and dirty install this is fast and almost unchanged from previous. This time I elected to pull in multimedia codecs and later on noticed that the BBC is gone from Totem, but integrated Youtube actually worked. The software center still keeps offering a restricted codecs package, one of these small niggles that detract a bit from the overall smooth feel, but it's understandable given that the installer added codecs straight from the repos. Boot up took around 7-8 seconds longer and this is quite a noticeable difference after the absolute raw speed that Lucid brought to the table. Actually, even typing this in Firefox seems somewhat laggy. There was a small difference in suspend and resume times but shut down was quick as well, it's mainly the time to login that sets them apart. One of the main problems identified by reviewers of the new release seems to be that the option to hibernate is disabled by default in 12.04, but there's an easy workaround. Nice enough, my Dell's keys for adjusting screen brightness and volume worked fine, and battery life that is at around 5 hours in Lucid is only slightly reduced. Dimming the screen when inactive as is the norm on laptops worked fine too in both LTS versions. I'm not using network file sharing and print the odd letter at the office, so my scenario is limited in this respect, but normally Ubuntu is very good at detecting connected printers and selecting the right driver for it. Unfortunately Ubuntu has made the leap to Grub 2, and, while it works fine if left alone and detects all operating systems that are installed, it is another example of obfuscating configuration to the ordinary user. Where before it was possible to simply add an entry, now you have to read an entire book and create separate files strewn all over the file hierarchy to adjust the menus settings or create your own. I believe it's supposed to be for the power user but is so annoying to fiddle with that you end up just accepting what the naming and boot order is. In terms of software you get a similar selection. LibreOffice has now replaced its cousin, Firefox is in 11 straight from CD, Chromium is in version 18 in the repository, all in all pretty similar to what you can get with the previous LTS. There were 103 updates pending in the notifier straight after installation, rising to 128 a few days later. The old Debian favorite Synaptic package manager is gone, and now the Ubuntu Software Center is supposed to look after you. It has been visibly spruced up and includes a lot of commercial software and even magazines to purchase. Canonical is visibly differentiating themselves here from the Linux crowd and is pushing a corporate branding and commercialization of their desktop. It all feels increasingly corporate but still 'human', maybe because of the colors. That brings us to the new desktop and how to start applications. As there is no menu anymore most users could probably get by adding all their most used programs to the dock on the left, which still cannot be moved. You can now decrease the size of the buttons to 32pixels though, which gives you a bit more space and looks more elegant as well. Fortunately there's a shortcut for it on the dock already, saving you from clicking on the Ubuntu icon round about where the menu used to be in the top left, entering a search for settings, then going into Appearance to select Launcher icon size. That should cover 95% of cases, and to be honest not even I am using more than 10 programs on a regular basis. There's also still the option of creating desktop shortcuts, unlike in Gnome Shell (where one has to allow Nautilus first to manage the desktop). Entering a search for install resulted in the Software Center and Update manager being shown, together with a commercial Management service and Ubuntu One. Typing 'music' and just hitting Enter gets Rhythmbox to start up, which has made an amazing leap to 2.96 but does not seem to have changed much from when I last encountered it in 0.13. It even played video podcasts a year ago in an external window. Here it is unfortunately very integrated with the Ubuntu One music store, another commercial offering. I don't think I'm fond of the road they're taking but it may work for a lot of people who are used to paying through the nose and for everything, people coming from the proprietary OSes who just want it easy. No loss, my sort of music isn't in any online stores anyway. You can uninstall the extension, and Last.fm and Libre.fm are quite handy to have from time to time. Without going too much into how Unity works, it succeeds at one thing and that is freeing up space. If you compare the shot below with the one taken in 10.04 there's a lot more screen estate and it feels fresher and more modern. Ultimately it's a very restrictive desktop interface though where one has to search for everything through the Dash, which opens up a lens or search box, and where you have no way of knowing what exactly is installed on a system. Here's a good look at Unity and the 12.04 desktop in general. The only benefit of this approach I can see is where the user does not know the name of the application and is entering a more general query like 'music' above. Looks-wise I was very impressed by Unity, application windows and top panel are virtually indistinguishable when maximized, see Firefox window, and this feels even smoother and more integrated. The expose view works well and transitional effects, fading and desktop switching are as smooth as before. You get drop-shadows and even a terminal overlay like Guake works well on all this visual glitter. The fake or chamaeleon transparency of the dock adopting background colors is helping away from the orange displayed in earlier versions of Unity, and the infamous scroll bars can be removed for a more consistent feel across as they do not work in all applications, just like global menu does not work with LibreOffice. Support on the desktop has been extended to five years for this release, which is giving you plenty of time to upgrade or eventually find something more suitable until 2017. Going beyond the looks and the desktop interface this seems to be a solid distribution so far, but at nearly 700MB Ram with four tabs in Firefox, ballooning to 845MB after a bit of use with only three tabs open where 10.04 settled on around 315MB after a spike to 420MB, this is roughly anywhere between 250-500MB more than Gnome 2. What's more is that it does feel somewhat heavier, in particular opening the Dash (or HUD?) is lagging when opened the first time after login. 12.04 doesn't have quite the same polish I came to appreciate before, search engines in Firefox do not seem localized this time, but it did pick up on the swap created earlier and took advantage of what 10.04 had failed to add. Ubuntu has still kept the indicator applet and added colors to symbolize the different modi of availability, and as hoped for removing the Ubuntu One cloud storage service also removed the entry in the applet in the tray area, which gives quick access to system and display settings but remains otherwise unchanged. Extremely fast and low on resources on hardware from the last few years. Familiar interface, clean Gnome 2 desktop. Appears very stable after four updates. 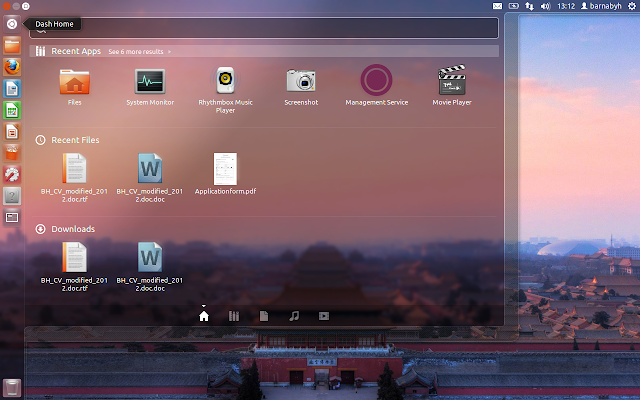 Very themeable, easy to configure and customize. Major applications are being kept up-to-date, backports and external repositories keep the system fresh. This article explains how to replace OpenOffice with LibreOffice for example if you want the latest. Some applications are slowly getting old, and with protocols not being updated connectivity and communication suffers. It was the same with Kopete once KDE 3.5.10 was discontinued. Less than a years of support left until if nothing changes. Mono is part of the install for F-spot and Tomboy applications. You might like Unity as well once you get stuck in and discover the options. Feels solid and just as in 10.04 everything incl. smooth desktop and fading effects seems to work (on the same hardware). 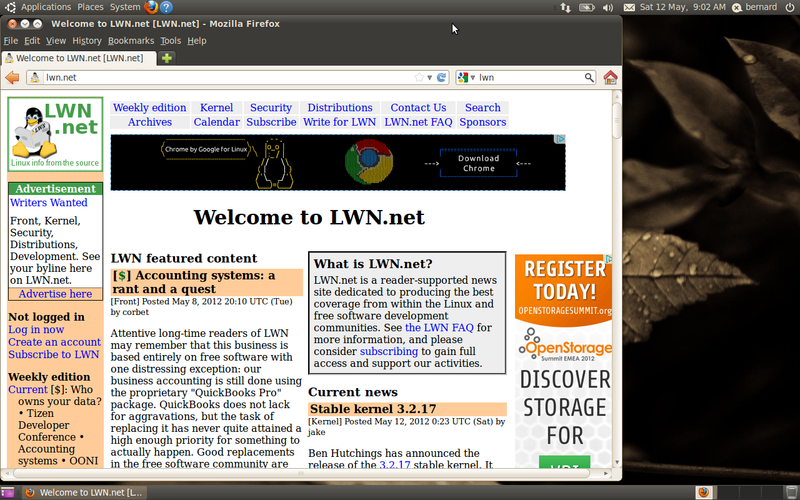 Latest stable software, supported until 2017. Better use of desktop space and more modern feel. Unity is the future for Ubuntu, get into it if you like the system and want to keep using it. They, hopefully, aren't going to change again but rather refine the desktop. Free of libmono libraries, and you finally get a proper application for photo management on top. Stylish gimmicks like setting the users wallpaper as login background give it a nice touch and make it feel more integrated. Not quite as fast, slightly longer boot time, but shutdown and suspending equal. Ram usage a little higher but not a problem with 1GB or more. One could argue memory is there to be used. Unity still not as customizable, and it's more difficult to navigate around and find settings to configure just about anything. HUD lenses and dash can't replace flicking through a menu quickly if you don't know what you're looking for. A lot of the 'enhancements' seem to be about eye-candy and do not make the user more productive either, possibly the opposite. Overlay scroll-bars and global menu do not work with all applications and detract again from the overall integration. Desktop layers obfuscate system internals and the file system in much the same way that WinXP did, and in best Gnome tradition continues to simplify the desktop interface to the point of being restrictive. For now I'm sticking with dual-booting. Both of them are nice in their own way. 12.04, ever so slightly slower, is just as good though once you get past the paradigm shift that Unity is, and will of course be around for much longer. Eventually I might put something on that enables the fingerprint reader and encryption out of the box, but I'm not in a hurry. Addendum: This was tested on x64-bit which uses more Ram than 32-bit editions. Memory usage after a plain start but with System Monitor open was a respectable 198MB for 10.04, going up to 222MB after a short while after some mouse movement had occurred. The respective figures for 12.04 are 377MB and 422MB and quickly rising from there without further activity. I wonder why Ubuntu 12.04 used so much RAM for you. On most systems it uses about 225Mb of RAM for the 32bit version. On both my systems it is about that figure while idle. "I wonder why Ubuntu 12.04 used so much RAM for you." It uses 785Mb on my system with only Chromium open. Grub2 has been in use in Ubuntu since 9.10 (Karmic). If you think its a "con" for 12.04 then it should be a "con" for 10.04. I'm still a n00b to Ubuntu. Thanks for letting me know. Didn't get to see a boot loader in 10.04, it just went into a black screen. Haha, because I can, lawl! But seriously, it was a tongue-in-cheek comment, and if you read closely it says 'to Ubuntu' after having abstained since 5.10. But I believe yours is also made with a wink ;). On Ubuntu 10.04, you have to install flash via synaptic or their installer script. Look up "flash" and select the non-free version, install and there you go. As regards with the RAM usage, Barnaby precised he tested the 64bit versions (now the recommended one) so this basically uses more RAM. - RAM: with 1GB or less (512MB is the minimum if you don't want it to be too sluggish) you should go for Lucid 32bit. Now if you are disciplined enough to never have more than 3 apps running (Firefox + Totem/Rhythmbox/Spotify + Skype/Pidgin/aMSN...) and closing them from time to time (esp. if you rarely if ever shutdown your computer) you can try Lucid 64bit or Precise 32bit. Bottom line: Lucid is fast, smooth and rock-solid (entering its 3rd and final year of intensive support), so unless you have a brand-new computer with Sandy or Ivy Bridge Core i3-5-7 and the now bare minimum of 2GB of RAM, you wouldn't want to go with Precise. Nice summary Viktor, +1 if comments allowed to do that here. I have added some plain figures for ram usage after start up,it looks like Unity/12.04 is using almost double the amount. In response to another query, Flash was installed in 10.04, allowing me to watch Utube in a browser (it wasn't html5). Thanks everyone for taking the time and effort to comment. Just to make it more Precise) waiting for "service pack" ISOs is not relevant if you're not installing across a network of computers. The end-user is presented the option to download (and install) the latest updates during the install since before Lucid I think. Yet point releases (12.04.1 etc) are milestones in the development so it's generally a good idea to wait for one if you're more interested in the LTS aspect of a stable durable system than just looking around the newy novelties of the distro. As for me I'll wait to check Mint against Precise (with and without Unity). What can you say about Gnome Classic? In Lucid, I was able to manage getting transparent backgrounds for panel applets, but it seems that has been broken with the new use of CSS in the themes' directories, instead of using the gtkrc file from gtk-2.0 (Precise uses gtk-3.0). For those who are genuinely concerned about memory usage with either the 10.04 or the 12.04 implementations of Ubuntu, there are two alternatives within the family, one, Xubuntu, which provides slight relief in resource consumption, at the expense of modest loss of capabilities. 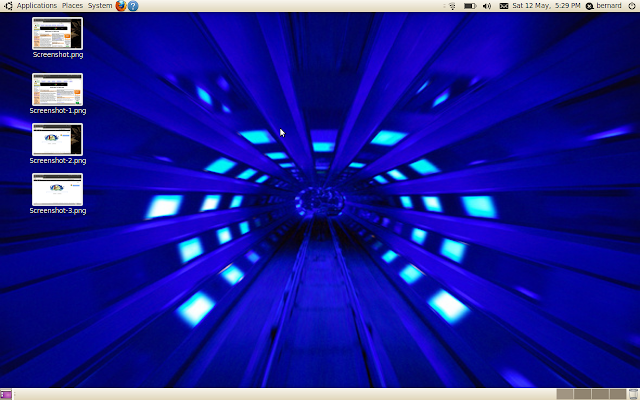 Xubuntu uses the Xfce desktop environment in place of GNOME. I find an idle system with only a terminal emulator running consumes just over 100 MB of memory, so you can run it on systems with 512 MB without problems, as long as you don't run a large number of concurrent activities. If memory or CPU are more of a bottleneck, and you are unable to acquire newer hardware, then Lubuntu is a significantly lighter consumer of resources, at the expense of being very simplistic. It does offer a light file manager, lighter media tools, in short, less capable, but acceptable alternatives for most basic desktop functions, and in return, it delivers snappy performance, even on systems five to seven years old. You may even be able to get it to work on systems that are nearly a decade old with care and caution. I was actually amazed to find that Ubuntu 12.04.1 32-bit, on my ThinkPad X220, uses around 225MB of RAM right after start-up, no apps running. This is only RAM actually used by programs, not counting buffers and cache (those are around 50MB and 350MB, respectively). I love the log-in features for 10.04 because you can send messages, and it kind of looks like a softer version of the Windows 7 Log-in, I think trying to be All-Unity is almost a disaster-plan for Linux-Ubuntu, but, that is a taste thing, and I like it being right in the middle. I used 10.04 on my Acer Extensa 5220, i then spent 4 long years, faffing around with Ubuntu 12.04 LTS, Puppy, Bodhi, etc. 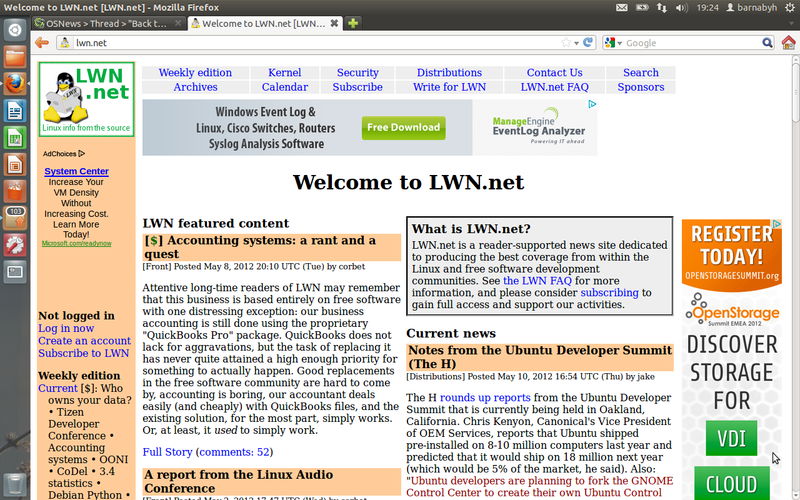 Just before 14.04 is about to be released this week, i know Ubuntu 10.04 was and is still the fastest. On returning to Ubuntu 10.04.4 I find its much faster, full bluetooth. 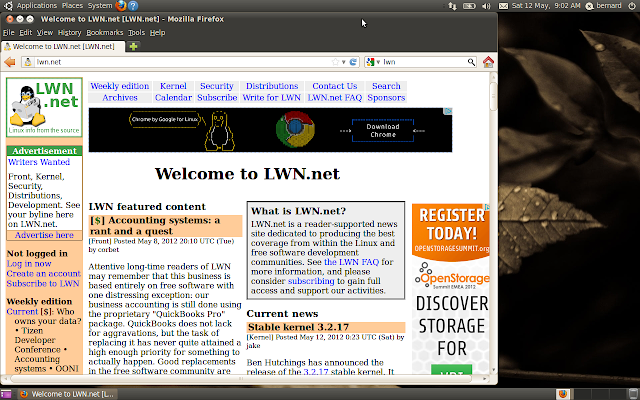 You also get nautilus, which the Xubuntu/ Lubuntu just does not work as in as much detail. They are also not as stable programs. something deeply wrong happened after Ubuntu 10. On deeper reading I found that Ubuntu 12.04 and Unity decided to give Amazon your search details, with something similar to "cookies" but built into the OS. That is something that can be turned off. You have to wonder with all that loss of speed, what is going on "under the hood"? 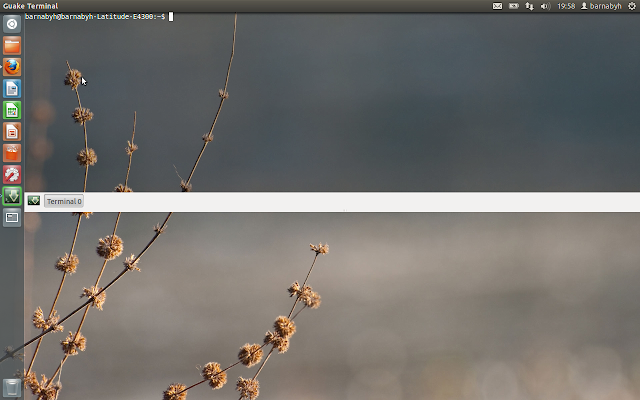 Also in Ubuntu 12.04. i just cannot feel happy without that program bar to switch between programs. Gnome 2 had a excellent file / program layout. For my work purposes i save considerable time over functionality in Gnome 2. Yes Gnome 2 has some bugs, where even restarting is required, but considering the fastest boot time i really don't care. I really hoped that Gnome 2 would continue to be developed as all the newer ones are much slower. I now have much more modern PC's than my Acer laptop (which all the shortcut buttons work). My hope is that i can install Ubuntu 10.04.4 on those new machines, as i like simple things like "bluetooth". I can say now that "Puppy" is so unstable, that on keeping that would not run longer than a week before i get rid of it. I crave the best speed, stability mix, Bodhi was really fast, but file manager is non existant, and the enlightenment Window Manager was not fully developed or stable. Many bugs to be fixed there. I still use Ubuntu 10.04 on my 1GHz netbook, because it's the fastest OS. 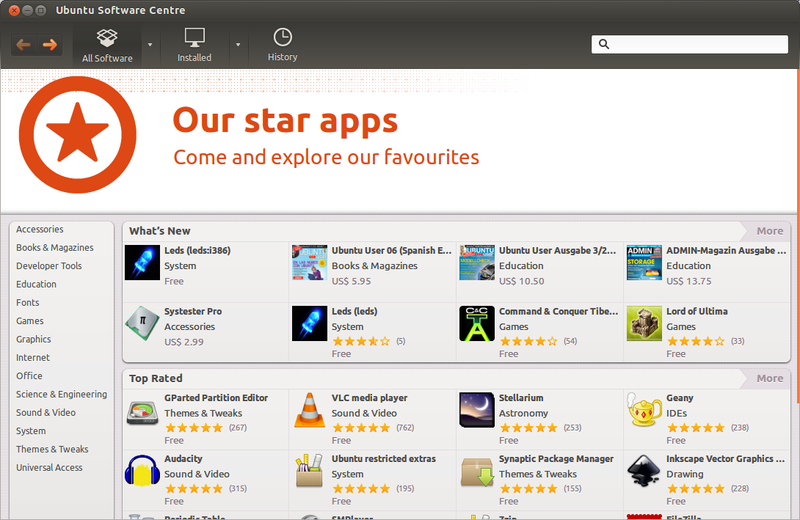 I've tried Ubuntu 12.04, but it's slower, Unity is plain ugly and its launcher sticking to the left has a very bad UX.